The ROCS (Road Communication System) is the system positioned at the summit of the ROCS Series. 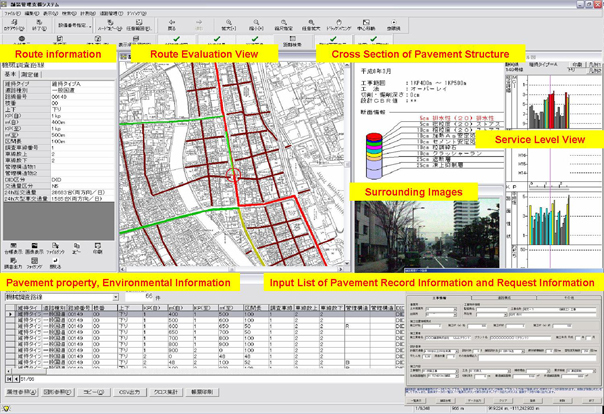 It incorporates functions for viewing road surface properties and conditions and various types of road information, together with a function for selecting construction methods, to support data utilization by the road administrator. In addition, by incorporating diversified information into the system and carrying out unified management, the system will support asset management through the promotion of “Making Roads Observable” by allowing a swift, precise, and multifaceted understanding of the current situation. Allows you to gain an appropriate understanding of the current on-site situation from the office. Results of patrols, requests, and disaster-related information are practically gathered and accumulated, so that searching and analyses can be easily carried out. Searching can be freely carried out as necessary for the data that is required. By carrying out various kinds of construction work selection simulations, ROCS supports the establishment of the most appropriate maintenance and repair plans.